spw020247 SCOTLAND (1928). 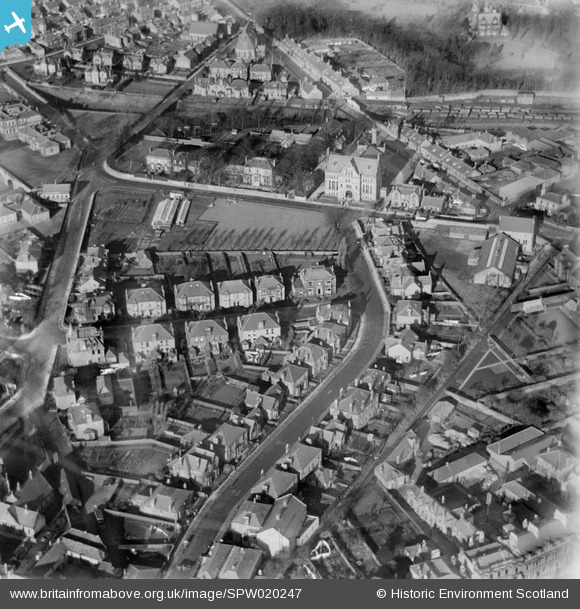 Alloa, general view, showing Town Hall, Marshill and Church Street. An oblique aerial photograph taken facing north. Title [SPW020247] Alloa, general view, showing Town Hall, Marshill and Church Street. An oblique aerial photograph taken facing north. St Mungo's School (as it became) Woodwork/Technical building. Teachers included Ian Stevenson and Mr Lamb. Dry and dusty inside, ye couldn't get a drink withoot fear of annoying the teachers! Greenfield House now houses the Town Council offices. The wagon road which was used to transport coal from the Holton area of Sauchie to Alloa harbour. Although the tracks are gone the road still exists from Station Hotel down to South School. Colville's Nursery now built over. I worked there delivering flowers on an auld fashioned heavy bike. Ten shillings for a Saturday, 8.00am till noon. Plus tips! Mr Colville senior was a very knowledgeable gardener. Drill Hall now no more. The Drill Hall now no more.